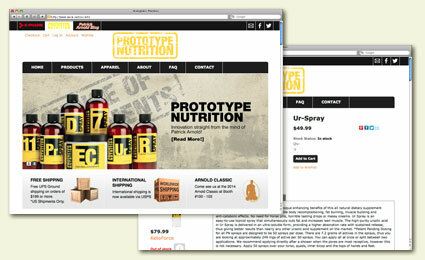 Project Description: Prototype Nutrition’s online presence began with one of the numerous turn-key solutions currently available around the web. While this turn-key solution offered a quick solution to being online, it was quickly discovered that the turn-key ecommerce solution was not going to be a good fit for their business. Custom functionality as well as tools to interact with their customers were extremely lacking with the turn-key solution and also very important to the growth of the brand and education of the customers regarding the product line. It was quickly determined that a more robust solution was in order to acheive the online goals that Prototype Nutrtion had set for itself. It is at this point in the project that Six Demon Studio became involved. After having several sit down meetings with the client we were able to determine what functionality they needed as a foundation, what was needed to help grow the business and what functionality would be needed in the future. The design itself was done in a flat design style with large emphisis on the product images and company branding. This clean style strips out the distractors to the consumer and focus on the thing they are most interested in, the products. As part of the ecommerce design, a new Prototype Nutrition logo was devised to use on all promotional materials in printe & online. The business model of Prototype Nutrition is one where sports supplements that are too expensive to be produced in large amounts are made in what is called "bench top manufacturing". This basically means that products are produced in small batches and then sold directly to the consumer to help keep costs down. Because products are regularly coming in and out of stock, in-stock notification was extremely important to help notifiy customers that product was available. Future goals where also planned for while building the new Prototype Nutrition magento ecommerce site as well. This future planning included large intergration with the email newsletter service: MailChimp and a complete referral partner program. By putting the framework in place for both of these futre goals at launch the client was able to reduce the cost of adding these features at a later date. Once the new Prototype Nutrition site was launched it’s sales and traffic numbers have been at a steady increase over their former ecommerce solution. This is due in part to their old ecomemrce solution holding them back and also due to the large amount of SEO and marketing support that SDS provided.